Nina’s doggie bed was a shredded and fraying mess. The grocery store had dog beds on sale for ten bucks, so we bought her one and she LOVES it. Unfortunately, Elvis loves the bed as well. After days of Nina just letting him sleep in her bed, she finally just gave up and joined him in it. 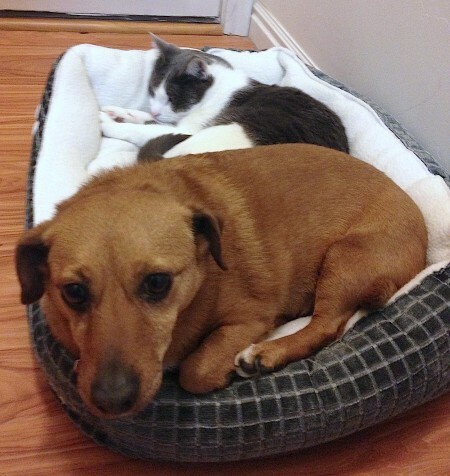 Elvis has been snuggling up to dogs his whole life. Here is a very similar picture of Elvis and Sid. The patience of a dog is unparalleled. The next time I am irritated by something, I’m going to remember Nina and Sid, patiently and kindly sharing their beds with Elvis.